TRUTH About Driving for LYFT – Should You Become a LYFT Driver? How Much Money Do Lyft Drivers Earn? 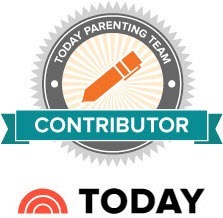 Get bonuses for driving during prime time! How do Lyft Payments Work? How does the Lyft Driver Program work? Can You Drive for Lyft and Uber? How to contact Lyft? What is the Lyft Phone Number? On this page you’ll find everything you need to know about working for Lyft and becoming a Lyft driver. Lyft is a ride-sharing service which matches drivers with passengers who request rides through the Lyft app. Lyft is one of the top car services like Uber. Working for Lyft is a great way to earn extra money whenever you want. You set your own hours. You’re your own boss! Every day, millions of people use Lyft in 180+ cities. You can work full-time for Lyft if you’re unemployed, or work only a few extra hours per week to pay bills or fund your dreams. Some drivers make $800+ just driving Friday nights and weekends. You’ll get paid instantly and are guaranteed to get paid because passengers pay Lyft through the app. You keep 100% of tips. Lyft drivers earned $500 Million in tips! Both women and men can become a Lyft driver. Because Lyft requires passengers to have a valid credit card to verify their identity (and therefore knows who they are), it’s much safer to be a Lyft driver than a regular Taxi driver. You can also rate passengers, and see passenger’s ratings before accepting a driving job. Lyft has high standards to maintain a positive experience for both drivers and passengers, so if a passenger gets too many bad ratings, Lyft won’t let them order more rides. Lyft provides a $1,000,000 liability insurance for all their drivers. coverage for bodily injury caused by uninsured/under-insured motorists when you are engaged in a ride. 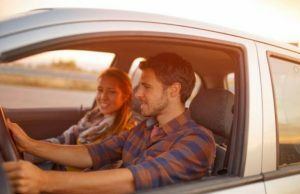 If you already carry commercial insurance or personal coverage providing specific coverage for ride-sharing, Lyft’s policy will continue to be excess to your insurance coverage. According to Time magazine, a survey conducted on 1,150 Lyft drivers found that Lyft drivers make ~$30/hour! In less busy areas or during less busy hours, drivers make around $17.50/hour. Some Lyft drivers earn over $800 just driving during busy hours on weekends and Friday nights. Uber drivers reported making about $15 per hour in the same survey. As a Lyft driver, you earn more because Lyft ride rates are a bit higher than Uber, and Lyft takes a smaller commission than Uber. Lyft offers a $500 Earnings Guarantee for completing 50 rides during the week. If you complete 50 rides and didn’t earn $500, they’ll pay you additional money to make you meet the $500 earning mark. This way you’re guaranteed to earn at least $2,000/mo. 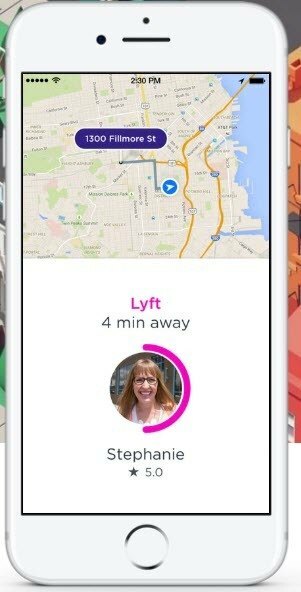 To encourage drivers to drive during prime time when there are more passengers who need rides than drivers available, Lyft offers drivers a monetary bonus. This cash bonus is applied as a percent on top of every ride’s final price during prime time. Get extra cash with new driver bonuses. Make more money from your first rides. Signup on this private invite page to get a BIG $$$ bonus. Other bonuses: Save on fuel, maintenance, and more with Accelerate, Lyft’s new driver rewards program. Go here for more info about Lyft payments, earnings, and Rate Cards. You’ll get paid instantly by passengers through the Lyft app. Even tips are paid through the app, although passengers can also tip in cash. Lyft drivers get paid a base fare fee, as well as per mile and per minute. You’ll also get paid for time spent waiting for the passenger as well as reimbursed for surcharges, tolls (such as airport toll fees) etc. Lyft takes a commission from the amount you earn. On average, drivers earn $2 more per hour with Lyft than with Uber because Lyft’s commission is lower. Passengers pay different fare prices depending on the region in the city. Lyft has a Rate Card which you can consult from the app to see which areas pay best in your city. You can see your earnings history in the ‘Earnings’ section of your Lyft Dashboard. You can see your bonus earnings calculations in the ‘Driving History’ section of your Lyft Driver Dashboard. You can wait for Lyft’s automatic weekly payments to get your earnings sent to your bank account or use Lyft Express Pay. 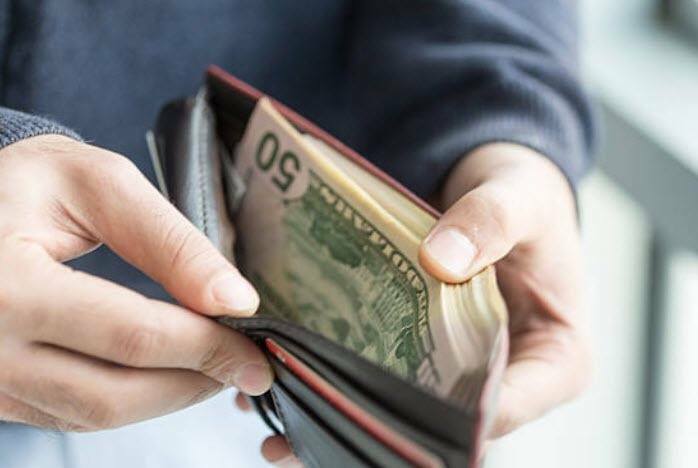 With Lyft Express Pay you can cash out your earnings whenever you want and get your money deposited in your bank within a few hours to a few days. You can work for Lyft even if you don’t have a car! As a Lyft driver, you can rent a car on a weekly base from one of Lyft’s partners. Even if you couldn’t get a car loan (because of your bad credit score or income level), you can get a car by working for Lyft. Lyft’s Express Drive car rental program is a weekly car rental, available for up to eight weeks. Because you pay week-to-week and there are NO binding contacts, you can stop it at any time. You can renew the car rental each week through the app. Lyft’s car rental program costs $99 a week, plus a fee for mileage. If you drive enough, the mileage fee is waived and when you drive even more, you’ll pay nothing at all. You can use the car as much as you want – including for personal use outside Lyft work. There is no mileage limit. Insurance is included in the car rental! Before opting for the Lyft Express, check your other options. Lyft Express Drive is really only best to use if you can’t get auto financing any other way. Can I get a car with Uber? Uber also had a program to help people get a car when no lender would approve them for a car loan, however, Uber was heavily criticized for having extremely high fees, high upfront fees, fixed-length contracts, and bad terms. According to an article published on Skift, Ousmane Abdoulaye leased a car through the Uber Santander car rental program in 2014. 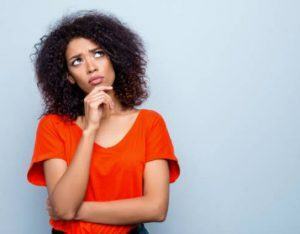 He paid $1,000 upfront, plus a monthly payment of $870. But after two weeks he was deactivated by Uber. He had no job, no way to terminate the contract, and no way to return the car to the dealership. And then he began getting calls from a creditor for the payments due. If you don’t have a car which qualifies and can’t afford to rent one, apply for an easy car loan (see list below). Or consider working first for DoorDash. DoorDash is a food delivery service. You can earn $15/h or more delivering food even with a bicycle, scooter, or motorbike. Then, once you have some more money you can get a car and join Lyft as well. 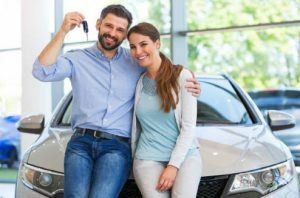 If you want to have your own car, here are the 3 best places to find great car loans with low APRs. Request free quotes from all 3 because then you can pick and choose the best deal. 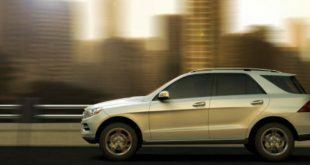 Choose from 2.5 million vehicles. Easy, fast auto financing for all credit types. New car rates as low as 4.99% APR. Get approved in seconds – 99% acceptance rates! APRs as LOW as 2.99%. Fast approvals. You could drive your new car today. Apply to become a Lyft driver on the Lyft website. Once approved, download the Lyft driver app. You’ll get notifications asking you to accept or decline a driving job. If you accept a ride, pick up the passenger from location A and drop him off at location B.
Instantly get paid through the app. It’s that simple! Lyft has high safety standards to ensure the safety of their drives and passengers. When you join to become a driver, you’ll need to consent to a free background check. The background check can take a few days to 2 weeks. If it’s been longer than 10 days, check on your application’s status and contact Lyft to remind them about you. Lyft will contact you with a reply either to reject or approve you after they finish looking at your application. Pass their free, online DMV and background checks. Have not committed any major felonies in the past 3 years. Have an active in-state car insurance. Drive a 4-door car (or rent one from Lyft) with 5-8 seats (including the driver’s). Meet your city’s vehicle age requirement (usually your car cannot be over 10 years old). 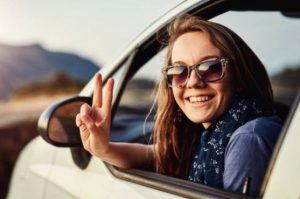 You’ll pass the driving record check if you do NOT have eight or more demerit points or a conviction in the past five years for impaired or dangerous operation of a motor vehicle, failure to stop at the scene of a collision, careless driving, or driving with a suspended license. For the criminal background check, Lyft looks back at least 7 years into national and county-level databases for serious crimes such as theft, property damage, violent crimes, sexual offenses, felonies, and drug-related offenses. Lyft does routine yearly background checks on all their drivers. You can read more about Lyft’s driver requirements here. If you’re not sure if you’ll pass the Lyft background check, apply first to a similar service first like DoorDash. DoorDash pays you to deliver food (you can work any hours you want). You’ll get nice tips! Because they also do a similar background check and send you the report, you can see what your report looks like, and if they accept you, Lyft will likely accept you too. Sure, you can! You can work for as many companies as you want. According to Wired, 70 percent of on-demand drivers work for Lyft and Uber at the same time. And according to a Ridester survey, drivers who work for both rideshare car companies earn more than if they were only working for one. If you want to work for Lyft and Uber at the same time, download the Mystro app. Mystro aggregates jobs from Uber, Lyft, and Postmates. No more wasting time checking all 3 apps for driving jobs. Just check one app! If you need more work, another great company to drive for is DoorDash. DoorDash pays you to deliver food from restaurants to people. You keep 100% of your tips! You can deliver on foot, or on a motorbike, bicycle, or with a car. DoorDashers usually earn $15/h or more during busy times/areas. Join DoorDash to earn extra money during less quiet hours when you don’t have much work with Lyft. It’s easy and free to join DoorDash! Out of the 1,150 drivers polled, 73% said they were either strongly or somewhat satisfied with being a Lyft driver. Uber drivers reported only being 43% satisfied with working for Uber. Several lawsuits (both class action and personal ones) have been filed against Uber for insufficient customer safety checks and malicious use of information. Lyft hasn’t had any scandals or lawsuits. Lyft does not clearly specify what hours are Prime Time. Usually, Prime Time is late at night, during rush hours, and holidays. According to driver earning statistics Lyft recently posted on their blog, 50% more passengers need rides at night from 11 PM to 2 AM than during the day. So it’s safe to assume that Prime Time at night is from 11 PM to 2 AM. Did you know you can get a cash bonus from Lyft by using a new driver referral code? Currently, you can get a $300-$1,000 new driver signup bonus from Lyft depending on what city you’re living in. How to get a $$$ new driver signup bonus? Simply signup on this special invite page to automatically get your $$$ signup bonus once your application is approved. There are different Lyft referral codes for new drivers at different times of the year and during different Lyft driver promotions. Sometimes you can get a Lyft $1,000 signup bonus or a Lyft $250 signup bonus. 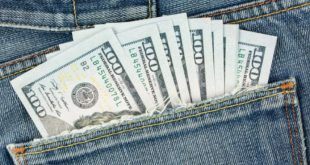 BEWARE: There are many scammers who post FAKE referral codes online promising HUGE cash bonuses up to $5,000. There is no $5K Lyft bonus. If you use a FAKE referral code, you won’t get ANY bonus at all after signing up! Not even the standard Lyft bonus all new drivers get. To get your real Lyft driver bonus, signup on the special invite page mentioned above. You’ll get the biggest current bonus Lyft gives. Lyft gives the same bonus codes to all their partners. There are no ‘miracle’ codes. How does the Lyft signup bonus work? In 2019, Lyft announced new drivers would get a $250 bonus after completing their first 100 rides within 30 days. Lyft can afford to give you a $$$ signup bonus because after you completed 100 rides they already made money from their fees. How to know if a Lyft driver promo code is real? If the promo code is real, you’ll see it mentioned on the signup page. (See image on the right.) If you signup on a page without a new driver bonus mentioned, you won’t get any bonus! Because you only have once chance to signup, be careful which bonus code you choose to use. Can I use multiple Lyft promo codes? No, you can’t. You can only use one. Does Lyft reimburse drivers for toll charges and surcharges? Any toll fees are automatically added to your passenger’s fare fee. As a driver, you’ll need to pay the toll fees upfront during the ride. After the ride, you’ll get reimbursed by Lyft for the fees when the passenger pays for the ride. Does Lyft fare estimate include tolls? Yes, Lyft calculates tolls into the passenger’s fare pricing. 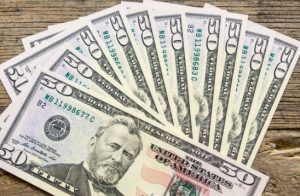 Can Lyft passengers pay in cash? No, it’s against the Lyft TOS for passengers to pay in cash. All payments, apart from tips, must be made through the app. Passengers need a valid credit card to pay for Lyft. Why? Because otherwise some cheating drivers might tell Lyft that their passengers didn’t pay for their fare even though they did and demand more money from them. When does Lyft pay drivers? Lyft automatically pays drivers weekly, on Tuesday. It can take a day or even 3 to get the money into your bank account. 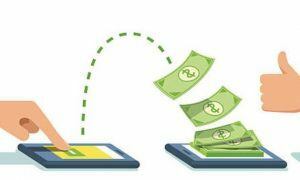 Alternatively, you can request instant payments from Lyft using Lyft Express Pay to quickly get your money whenever you need it, instead of waiting a week to get paid. Does Lyft cover car damages? Yes, Lyft will cover damages caused to your car by the passengers. For instance, if a passenger vomits in your car, Lyft will reimburse the costs of cleaning up to $250 and charge the passenger an extra $50 fine. Some drivers have tried to cheat Lyft and their passengers by throwing water over their seats and claiming a passenger vomited in their car when they didn’t. This trick usually backfires and gets the scammy Lyft driver deactivated and fined by Lyft. So don’t try to cheat to get a few extra bucks! Is it safe to drive for Lyft? Driving for Lyft is much safer than working as a regular Taxi driver. Lyft verifies passenger identity through their credit card and knows exactly who the passengers are. Lyft also provides up to $1M commercial automobile liability policy, and designed numerous safety features into the Lyft app. Drivers and passengers also rate each other at the end of a ride to uphold their high community standards. If a passenger gets many bad ratings, Lyft won’t let them request any more rides. When is Lyft prime time? 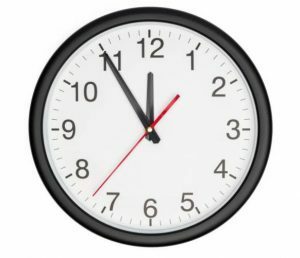 Prime time is usually late at night, during rush hours (before and after people finish working), on holidays, weekends, and busy hours. Lyft drivers usually get paid 20% extra during Prime Time. Lyft Express Drive is a program for people who want to work for Lyft but don’t have a car. You can rent a car for cheap from one of Lyft’s partners. How does the Lyft app work? When a ride request comes in, you’ll see information such as the passenger rating, pickup and drop-off locations, and have 15 seconds to accept or decline the job. After many users complained that the Lyft app was distracting and clunky, Lyft recently updated their driver app with many great features, making it very easy and fast to use. The new Lyft driver app has many new features including streamlined pickups/drop-offs, airport pickups, and one-click accept or decline a ride. Your car cannot be over 10 years old. The exact Lyft car age requirement depends on your city’s vehicle age requirements. You can find more info by checking Lyft’s requirements for your city here. How to get a Lyft signup bonus? 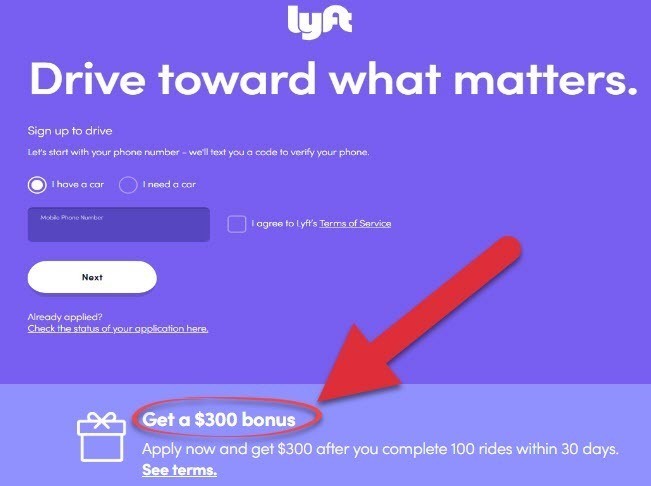 You’ll need to signup on this page to get the current $300 signup bonus Lyft is offering new drivers. Can I use 2 driver signup bonus codes at once? No, you can’t. Only one. And before you ask, you can only signup to Lyft once – sorry, you can’t make a career out of just getting new driver bonus codes. 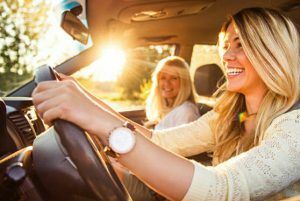 Can I drive for Lyft with friends or relations in my car? No, you can’t. If you have anyone else in your car when you’re picking up a passenger you risk being deactivated instantly if the passenger complains. You also can’t pick up multiple passengers at the same time. Just like hiring a regular taxi, when a client pays for a ride, he doesn’t want to be squished into the backseat with other strangers. You can work driving for Lyft any time you want and anywhere. You can work at 2 AM or at 8 PM. It’s up to you. Lyft does not have any strict working hours. You do not have to check in at a certain time. Can you only contact support during Lyft office hours? As a Lyft driver, you can get 24/7 support from Lyft through the Lyft driver app. Call the Lyft customer service at any hour and you’re sure to get an instant response. They have excellent, friendly customer service! Lyft provides 24/7 phone support through their app. Just click the big pink button “Call Me” within the Lyft app to get a support representative to instantly call you. Lyft is famous for their warm, engaging customer service. Lyft and Uber do not provide a phone contact for emergency or incident reporting. If you’re in an accident or emergency, call 911. Lyft’s official phone number is: 855-865-9553. However, the representative answering this phone number will likely tell you to use the support form on their website or the “Call Me” button in their app. Lyft also has a Facebook group for drivers where you can hear tips from other drivers, ask for advice and post questions to other drivers. Previous Are Free Amazon Giveaways Legit or a Scam? 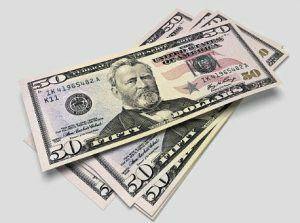 Next Free Instant Win Sweepstake with a $150,000 Cash Prize!